Share your #4 favorite classic comic horror character here. Be sure to include an explanation and (preferably) an image to justify your selection! Not sure I can do better than Slam_Bradley did in describing this pair for his #5 choice last week. 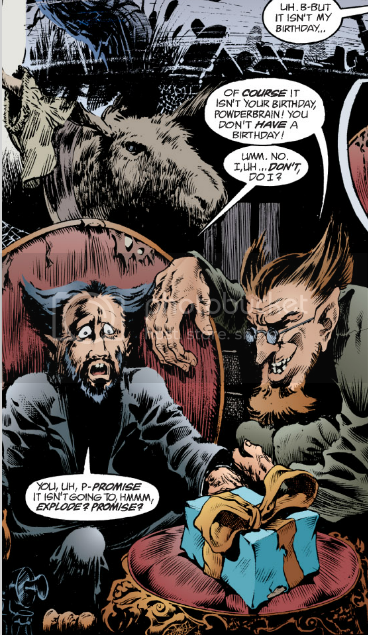 Though two beings, they function as a single entity in Gaiman's Sandman, much as one would consider Bert & Ernie, Bill & Ted, or Beavis & Butthead to be one entity, incomplete without one another. It's just the sheer range of emotions Gaiman evokes from these two bit characters in his sweeping mythology. They can be comical, terrifying, and evocative of tremendous unexpected pathos all at once. Gaiman truly and believably makes them the original siblings of mankind, suffering extremes of the conflicting turmoil of emotions every human has ever experienced with his or her sibling since the dawn of Man to today. Thus, their emotional highs and lows resonate with tremendous familiarity to us. We love and fear these characters because we recognize them within ourselves and our loved ones. 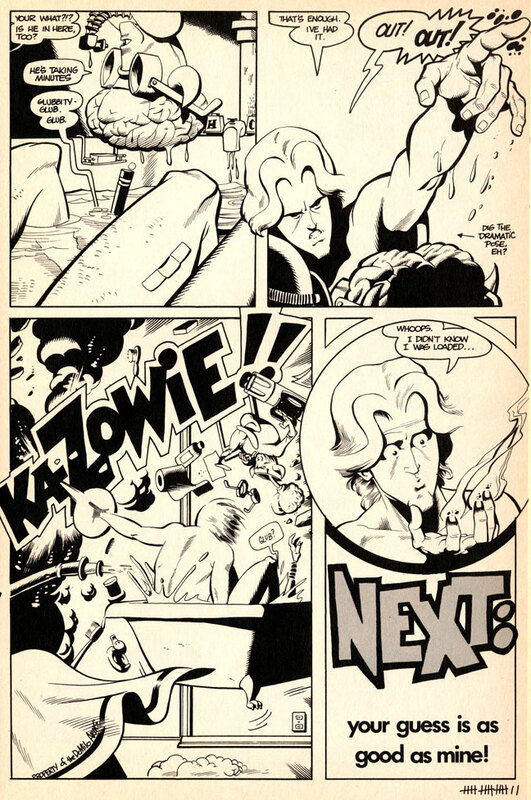 introduced as part of the short lived Bravura imprint of Malibu and moving to Dark Horse, Oni and others afterwards, this motley crew and Brereton's unique art style have led a nomadic existence that has carried me with it. 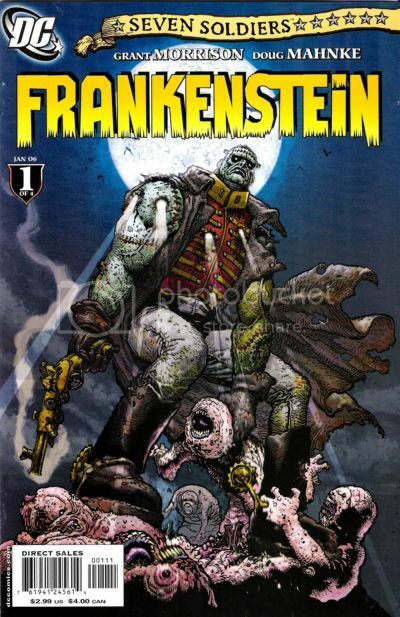 Brereton mixes pulp and horror elements as this unique group of horrific creatures led by Doc Horror and his daughter Eve fight crime but are forced to do so from an underground hideout and lair because of their nature (and their general aversion to sunlight). 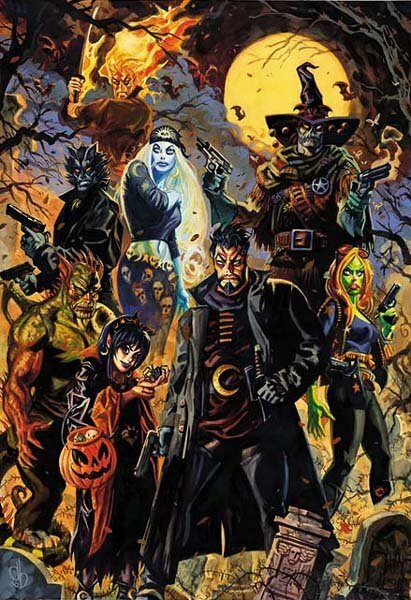 These characters and this feature just oozes Halloween and Brereton's moody spooky art just seals the deal for me. Frankenstein, or A Modern Prometheus by Mary Shelley has always been one of my favourite horror novel. (Hell, it's one of my favourite novels, full stop.) And no one can deny its cultural significance. 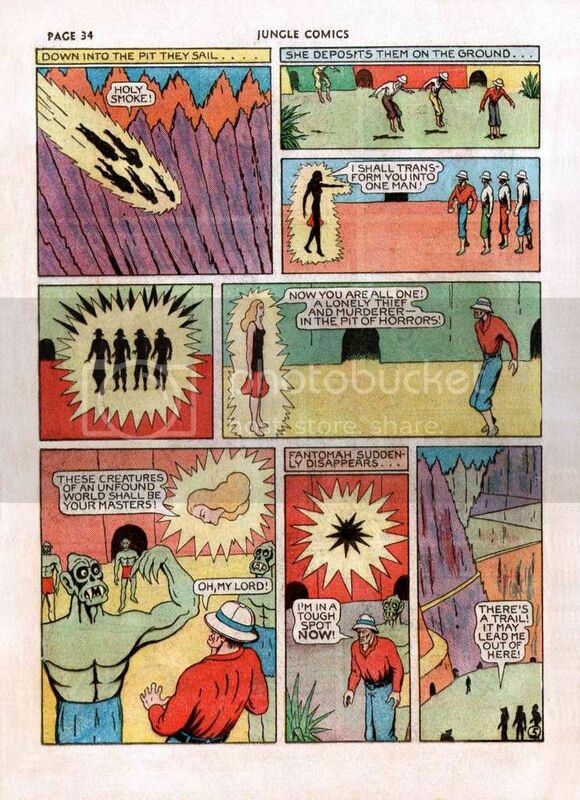 It has spawned countless interpretations in film, television, stage, prose and (of course) comics. And while I have enjoyed many of these interpretations, many of them miss what I consider to be one of the central aspects of the monster. That is that he is not some mindless brute, but rather a tortured intellectual; cast out by the father who should have loved him, and left to find his way in a world that feared and hated him. With Morrison's erudite character - essentially a warrior poet - I could believe that this was the same entity as Shelley's creation. He gave it enough unique twists to make it something that was clearly his own, but building upon the exquisite framework Shelley had crafted in her original novel. So for capturing the essence of one of my favourite novels, while still building an interesting an engaging comic character, this gets 4th spot on my list. 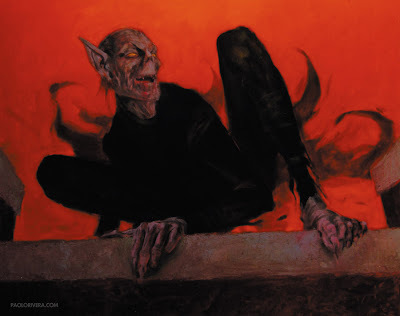 First appearing in the pages of Amazing Spider-Man, during the somewhat controversial "Six-Arm Saga" of the early '70s, Dr. Michael Morbius was a Nobel Prize-winning biochemist who became a living vampire when he tried to cure himself of a rare blood disease, by injecting himself with vampire bat blood (as you do!). 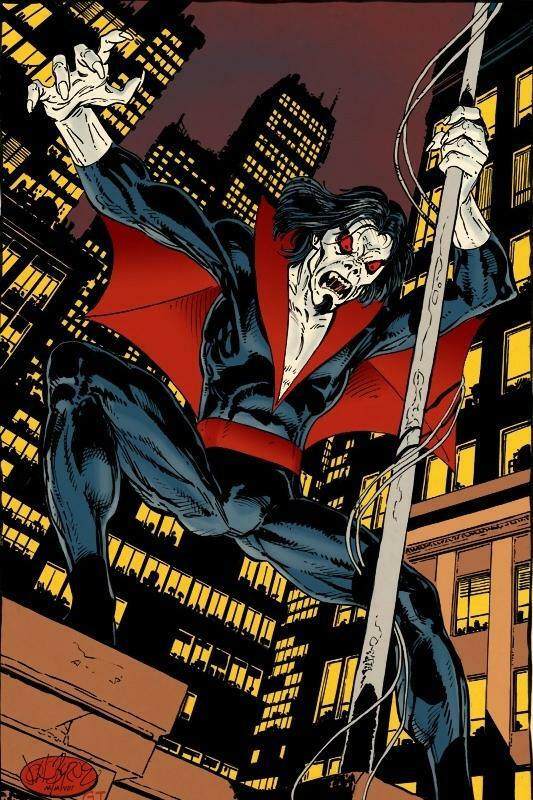 The thing that I liked most about Morbius as a kid, aside from how cool he looked, was that he was actually quite a tragic figure; an essentially good man, who had been cursed by a terrible fate. 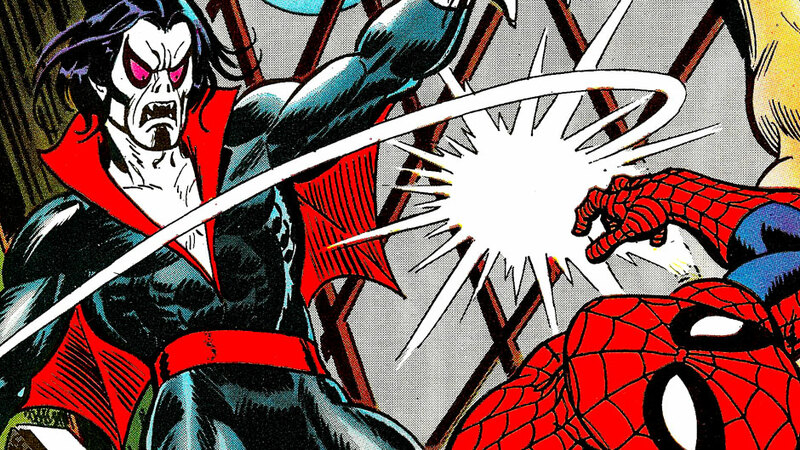 Morbius remains one of my favourite Spidey villains, and one who really doesn't get enough respect among Spider-Man's rogue's gallery. And from a storytelling perspective their personalityless characterization allows writers to focus on exploring the darker aspects of the human psyche. Sorry if I've missed something you said earlier about why you can't include pics in your posts, but it should be very easy to include images. Also, forgive me if I'm telling you something that you already know, but if you find a picture in Google image search that you want to include in a post, just copy the picture URL (not the web page address, but the actual picture itself) and then paste it into the message between [ IMG] [ /IMG] tags (close the gaps that I've left to make the tags display). As long as the website you're getting your images from doesn't disallow hot linking, that should work and the image will appear in your post. I only say all this because I really, really would like to see Nagai's Devilman. Sorry if I've missed something you said earlier about why you can't include pics in your posts, but it should be very easy to include images. Also, forgive me if I'm telling you something that you already know, but if you find a picture in Google image search that you want to include in a post, just copy the picture URL (not the web page address, but the actual picture itself) and then paste it into the message between [ IMG] [ /IMG] tags (close the gaps that I've left in to make it display). As long as the website you're getting your images from doesn't disallow hot linking, that should work and the image will appear in your post. Sorry guys. As i stated in the Halloween prelude my posting is done during work where our computer is encrypted and blocked to the Nth degree not allowing for picture downloads or uploads or copying/etc. We have had too many hacks so the Hospital has chosen to go extreme in trying to prevent future problems. I am lucky to connect to the CCF site some days and other days it takes forever to connect and don't even get me started on complaining over this. Frustrating indeed some days for me. Also, since i am on a computer all day long i don't have a home computer set up or internet on my cell phone to do any postings. Makes me sound like that angry old guy down the street still living in the old days don't it? But after a day spent dealing with computers and staff when i am at home it is time to unwind so it is back to old school methods for me with books, music, comic books, television/dvd's and working in the yard for me. Makes me sound like that angry old guy down the street still living in the old days don't it? I thought that was part of the membership requirement for this forum? No worries brutalis, I totally understand. It's a shame, but I realise that it can't be helped. Great to have you participating of course, even without images, my friend. No worries brutalis , I totally understand. It's a shame, but I realise that it can't be helped. Great to have you participating of course, even without images, my friend. For my #4 choice, I'm reminding myself that it's not "scary" characters, or "horrific" characters, but rather "Horror" characters. so I'm gonna go with a favorite (i know, i know, why am i putting a "favorite" at #4 then?. . . because there are other things i like more. . LOL). 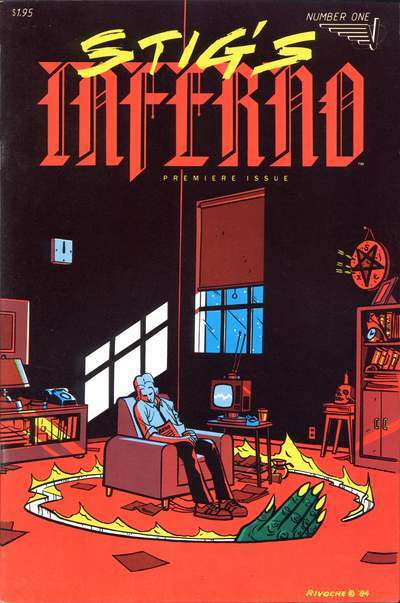 Long story short, "Stig's Inferno" is the story of Stig, who finds himself in Hell, and sit's on Satan's throne, and is suddenly the boss. that's just the short hand version. 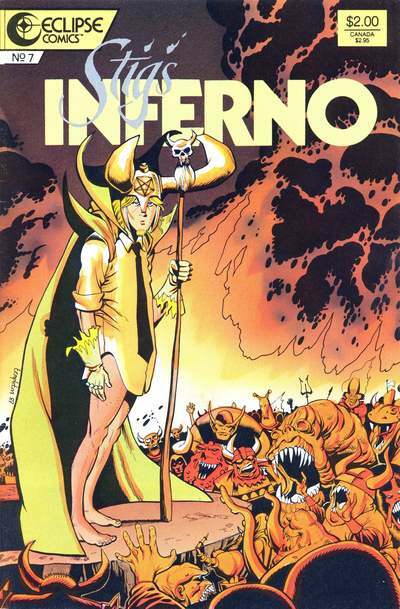 . . it's really a (very) loose adaptation of Dante's "Divine Comedy", and one of Ty Templeton's first works. I discovered this in the 80's while I was in my 1st year of College and man did it just click for me. funny in all the right ways -- ie: horrific but hysterical situations, some beautiful art, and that Templeton sense of fun & humor that he went on to utilize strongly in in many other books in later years. (I also must admit that I found Stig very attractive to look at, tho I was always too embarrassed to ask Templeton for a sketch of him when I met him at cons over the years). 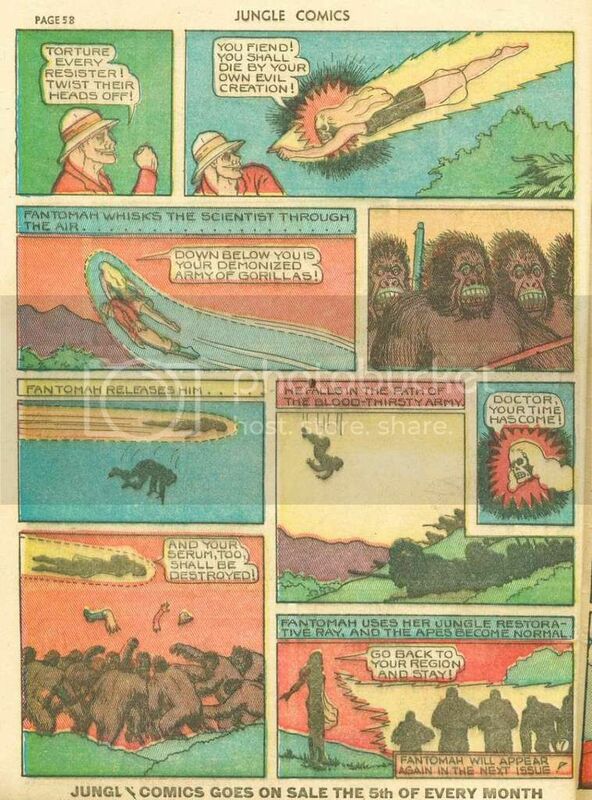 For fourteen issues, the inimitable Fletcher Hanks brought his creative madness to the jungle with the astounding Fantomah. 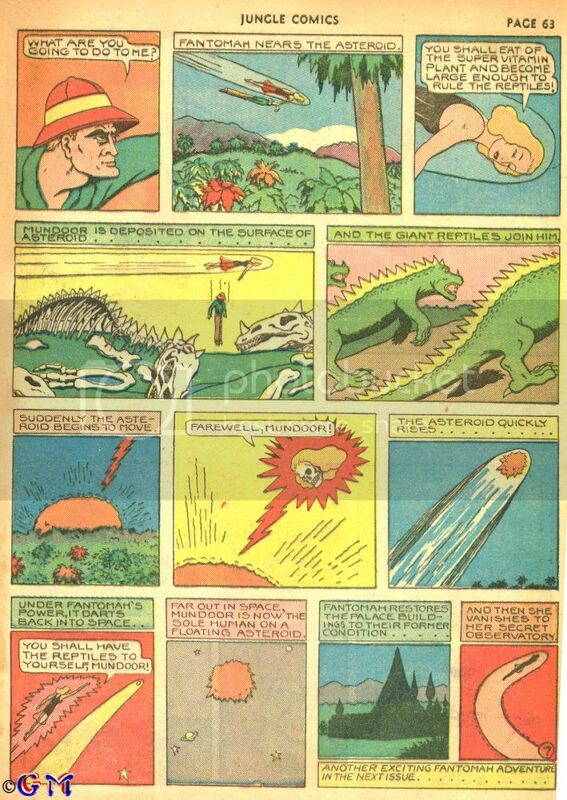 Like his other most noted characters Stardust the Super Wizard and Tabu, Wizard of the Jungle (who preceded Fantomah in Jungle Comics 1), Fantomah was a nearly omnipotent, magical figure meting out horrific vengeance to those who disturbed the ways of her domain. Hanks augmented the visual appeal of his technically limited and stiff drawing by granting Fantomah the memorable and startling transformation from jungle "beauty" to a skull-faced horror (that retained her golden locks), or even sometimes to just a floating skull. You get the idea! Hanks' work had a crude veneer, but a hypnotic tone and a solid design sense, and I've loved his work since the first time I laid eyes on it. Of all his (few) creations, Fantomah is the most astonishing, horrific, and unforgettable. I really want to read this now. Was this series ever reprinted?